Happy Kitchen Sink Stamps Monday! There's a few things cookin' in the kitchen this week, first up is a new challenge, with your challenge hostess Angela. 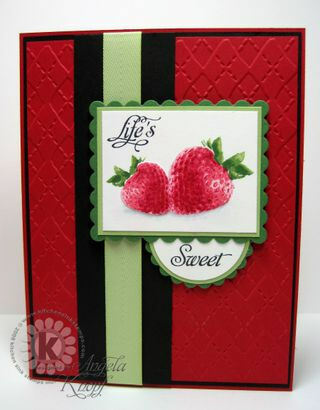 This month Angela is challenging you to CASE a KSS DT member, using your Kitchen Sink Stamps. I had a hard time with this challenge, as I believe we all have our own "style" of stamping, as you'll see my inspiration was there, but I fail when it comes to CASEing. For complete rules on KSS Challenges, click here. As I mentioned last week, the discount code I provide to my blog readers would be changing. Effective today, the only way to receive the 10% discount at Kitchen Sink Stamps is to use the referral link (no more typing in a code). The link will always be on my sidebar - just click the KSS Logo and it will automatically take you to the KSS Store. Note it will bring up an empty cart, but you will see the discount is already applied, just click continue shopping to add items to your cart. You'll also continue to see the referral link in my post for easy access to the store. Should you have problems with the referring discount link, please email me. Onto today's challenge....I chose to CASE this card from Angela. I love looking through Angela's gallery, she has such a wonderful CAS design to her cards, something I struggle with. I'm the queen of layers, and as you can see I did pick one of her cards that had multiple layers, but it also used Embossing which I don't use that often. Here's what I came up with, my CASE turned out to be more of an "inspired by". 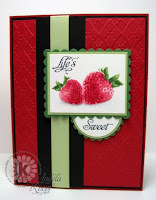 I did attempt to follow Angela's layout and use of embossing, but as you can see, my card went in another direction. I changed my image to the Kitchen Sink Stamps 3 Step Holly and Mistletoe, added a strip of Basic Grey Paper where she had ribbon and card stock, and added some bling. Click here to save 10% on all your purchases at Kitchen Sink Stamps. MORE SINK NEWS - next week there will be a new release in the Kitchen, watch for a sneak peek on my blog later this week! Beautiful, luv the new stamp. Luv how you enlarged the original layout and still "cased" it. What a beautiful holiday card Lisa! 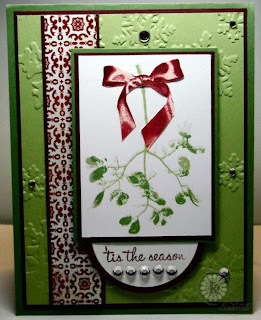 I love the rhinestones on the embossed snowflakes and the mistletoe image! Love the mistletoe and that layout is fantastic. Beautiful case card! Love the green embossed background! Have a great Monday! I love your fabulous holiday version of Angela's beautiful card!! 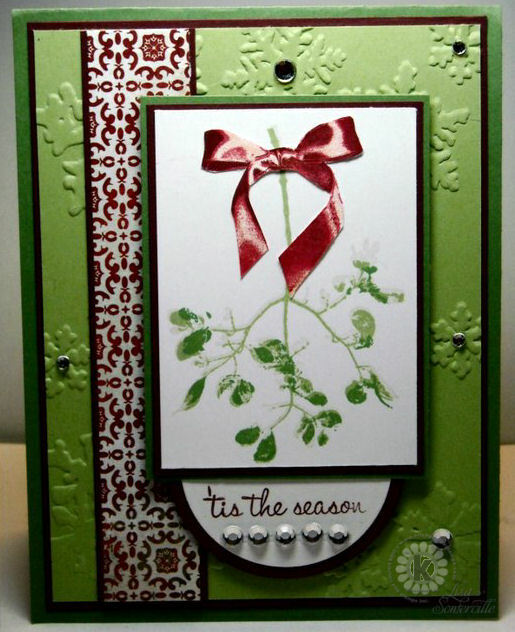 A sensational mix of colors, textures and patterns on this gorgeous Christmas card, Lisa!! Beautiful card Lisa! I might have to case YOURS! LOL! Great CASE, love the colors of it! What a beautiful card, Lisa. I love how you added the shine from the bling as it would be from outside. It is really a beautiful card. Angela's card is wonderful in her way...you have your own style. Both are great. If you ever want some REAL mistle toe...we have trees full of it! I thought of wrapping the stems...and outlining in gold as a tiny gift...but it is poisonious! Great card! I love the work you have been doing...but especially lately over the last month or so! OMG! I am unfamiliar with Kitchen Sink Stamps, but that image you used is gorgeous. The leaves look so realistic. I'm headed over to their shop right away. Clearly I have been missing out. Such an honor to have been CASED by you. I am always awed by your work and LOVE the direction you went from my "inspiration" piece. Such rich colors!